Canada’s contribution to winning the Second World War, particularly in the air and at sea, was out of proportion to its relatively small population at the time. The Royal Canadian Navy, perhaps not surprisingly, specialised in escorting convoys from North America to Europe, guarding the precious merchantmen against German submarines. For this task, a new type of ship was created. The corvette, taking its name from a ship of similar size and purpose in the days of sail, was the smallest ocean-going fighting vessel; the RCN manned dozens. 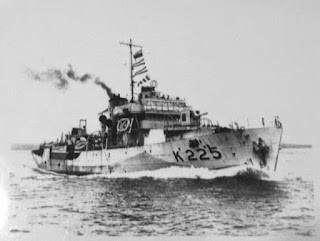 Corvette K-225 is the fictional story of one of these ships, HMCS Donnacona. Its captain (Randolph Scott) had just lost his previous ship to a deadly submarine attack, and is obsessed with getting back to sea. Aided by his surviving crew, he must whip a new complement of officers and men into shape, even while sailing the ruthless Atlantic. It’s just a matter of time, however, before the u-boat wolf-packs find this latest convoy and close in. 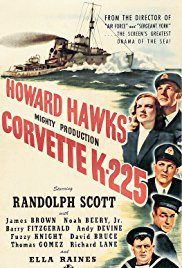 Though not up to the standard of the more episodic The Cruel Sea, which benefitted from superior writing and the fewer constraints of peace-time filming, Corvette K-225 is nonetheless an exciting action film with the addition of being informative, for anyone even mildly interested in the naval sphere of World War Two. The script provides a great many facts about corvettes and convoys, most of them delivered incidentally or implicitly. We see the Donnacona being launched, fitted and manned; we see it in training and in battle. We see the cook serving as barber, the cramped quarters and minimal comforts. 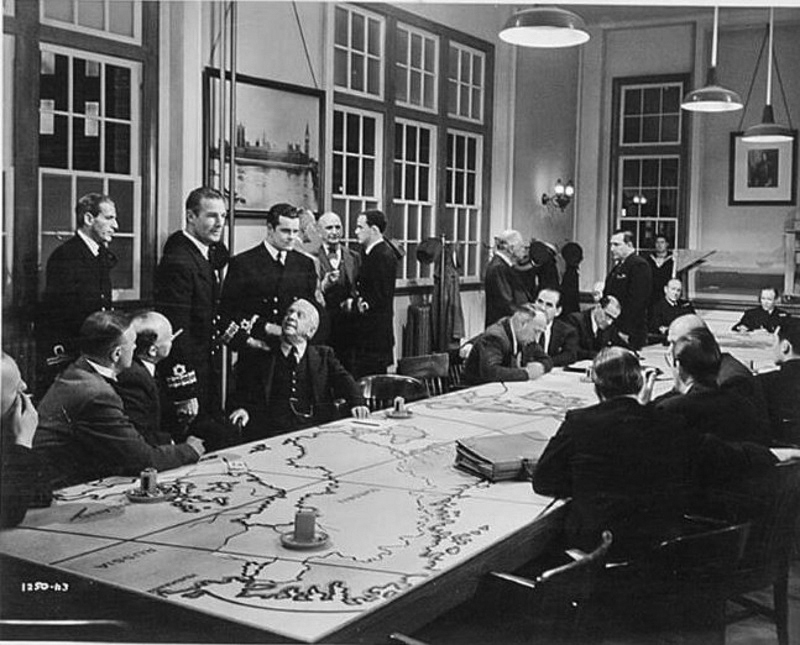 The planning of the convoy is just as interesting, the conference of the convoy’s senior officers is detailed, and clearly taken from real life. The action is quite thrilling and, though we can be assured that the ship will triumph over its tribulations, the script keeps us guessing as to who will survive and whether the ship itself will see land again. The climactic battle between the corvette and a surfaced submarine is almost topped by the storm scene mid-way through the movie, a scene which will probably make a landlubber queasy. 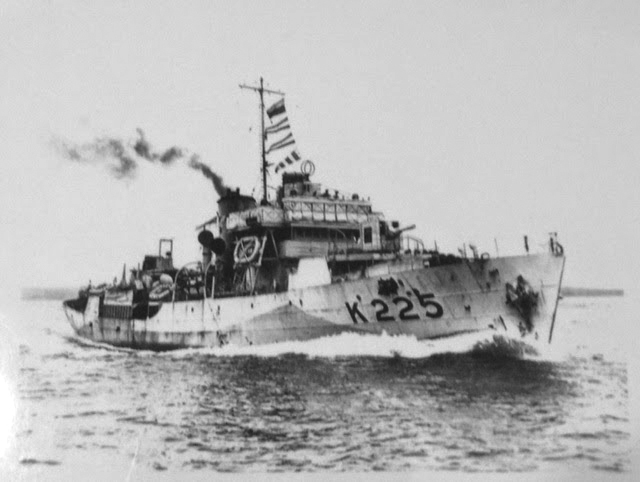 There was a joke in the RCN that ‘corvettes would roll on wet grass’ – a sea with waves higher than the ship would be proportionately intimidating. While the script is good, the story is melodramatic. The taciturn captain, driving his men and himself hard, falls in love with the sister of one of the officers he lost with his first ship. He then finds that her younger brother will be joining his new crew. The love-interest is unnecessary though harmless; it is pretty much forgotten after the ship leaves Halifax. 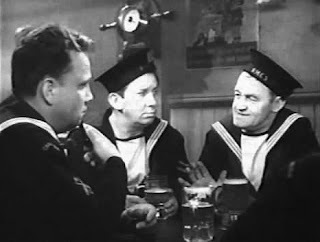 A more satisfying aspect is that the ship’s crew is not filled with the oddballs and misfits that populate many war movies, unrealistic caricatures created for laughs or memorability. There are more flesh and blood people here. 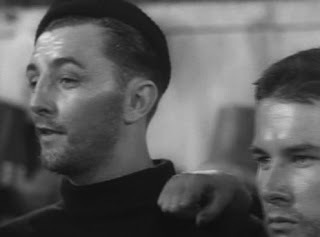 The actors give good performances. 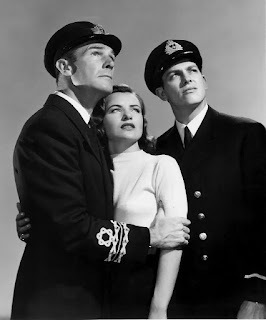 Scott is rather unemotional, but that’s more his character than his talent, and Ella Raines, in her first movie, does very well with what she is given, an indication of how she would handle the more substantial roles to come. Barry Fitzgerald is an unlikely but convincing long-time sailor. 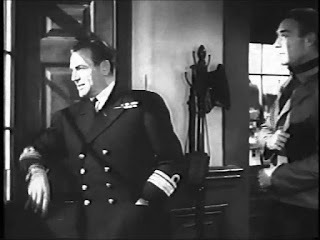 There are a remarkable number of then unknown actors who would become more famous: a very young Cliff Robertson; Peter Lawford; Robert Mitchum, already a veteran of several films but still uncredited; gravelly-voiced Charles McGraw, as the chief engineer; Ian Wolfe, a third of the way through his seventy year acting career. Corvette K-225, then, is an entertaining yarn with adequate performances and a sense of realism: all together, a fine slice of history, served up as exciting fiction.